Three Laurier graduate students received top honours at the 2016 Graduate Student Poster Showcase and Competition held in February. The competition, organized by the Wilfrid Laurier Graduate Students’ Association (GSA), provides graduate students with the opportunity to showcase their research and other projects, while making interdisciplinary connections and honing communication skills. 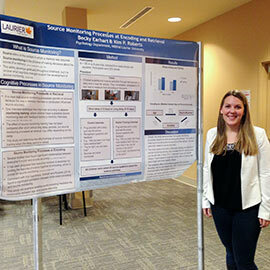 Becky Earhart, a fourth-year PhD student in the developmental psychology program, placed first for her poster entitled, “Source Monitoring Processes at Encoding and Retrieval.” Earhart works alongside Kim Roberts, professor of psychology, in the university’s Child Memory Lab. Opportunities to share her research have been an important part of her graduate experience. Philip Pham-Ho, a master’s student studying integrative biology, and Byomkesh Talukder, a PhD student in geography, tied for second place in the competition. Pham-Ho’s poster, “Mechanisms of Brain Swelling in Rainbow Trout” explains the research he is undertaking at the Laurier Institute for Water Science with his supervisor and associate professor of biology, Michael Wilkie. Talukder’s poster, “Multi-Criteria Decision Analysis (MCDA) Technique: A Tool for Assessing Sustainability of Climate Smart Agricultural Systems” details metrics for evaluating agricultural sustainability in the coastal regions of Bangladesh. Talukder is conducting his research at the Laurier Centre for Sustainable Food Systems under the supervision of the centre’s director, Alison Blay-Palmer. Robert Gordon, vice-president of Research at Laurier, commended the collaboration and research excellence that the university’s research centres provide. “Laurier’s research centres bring together dynamic faculty with excellent graduate students to carry out innovative research,” said Gordon. Joan Norris, dean of Laurier’s Faculty of Graduate and Postdoctoral Studies, echoed Gordon’s comments, expressing enthusiasm for the mobilization of graduate student research within the broader Laurier community.